How much time and energy have you wasted trying to tell people about your opportunity but not getting anywhere because you couldn’t handle common objections? Now, what if you could have all that time, energy and lost profit back? What if you could increase the percentage of prospects you converted? What if you never again lost a sale to an objection? What would a system like that be worth? 3 Step-by-step Course Modules that will change the way you see an objection, give you the proven strategies used by the best communicators, and outline the exact steps you need to take the next time you are confronted with a useless objection. Downloadable Workbook that will help you solidify the lessons you learn. Bonus Course Module revealing the very best responses to over 20 of the most common objections. In this course, you’ll learn how to rewire your brain so that you view objections as a positive rather than something to be feared. I’ll show you the 5 keys that will prepare you to overcome objections and lead you to success. These are the very steps that I use for every possible objection that I ever encountered. These steps really do work with any objection, even ones that I haven’t thought of! 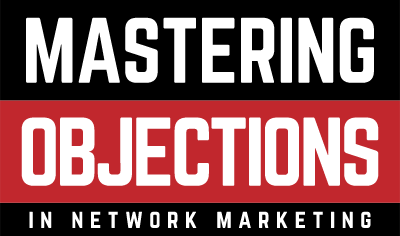 This course uses role play to demonstrate how to handle over 20 of the most common objections you might face in the Network Marketing profession.